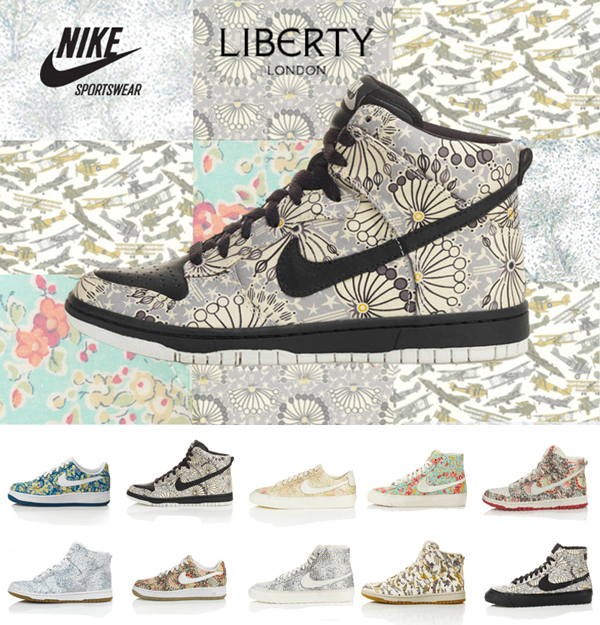 These gorgeous Liberty of London Nike kicks have just been added to my wish list. They debuted a selection of these a few years ago (which of course sold out) but they are coming out with even more of these babies starting on April 1st -- tomorrow! They will start out being sold exclusively at Liberty and according to their blog you will be able to get them online and with international delivery! Hooray. These are amazing..will for sure have look tomorrow! No way!! haha! I didn't know they had these in the past. These are so funny and awesome! They're men's or women's? I guess unisex - it would be cool to see them on both, me thinks! Fun kicks....love the floral prints! Hah! I know where I'll be spending my lunch break tomorrow! I remember when these came out the first time (I was filled with shoe-lust), and now I want them even more.... if that's possible. Beautiful, beautiful sneakers. My husband better get me a pair! It's payday tomorrow, too! Woohoo! Thanks for posting. I haven't worn Nikes in a dog's age, but I would wear these in a second--Liberty does it again! All the cute lowtops are already sold out...seriously? In less than a day? Wow. is this an april fool's day joke!? OK, I love these! But you know what needs to come next? Liberty print REPETTOS!! P.S. We're hosting a swanky giveaway this week + you're invited! I'm curious to know, which one is your own favorite?